flank took this picture of the Telstra Stadium in Sydney (then known as “Stadium Australia”) on 29 June 2002, the night that Australia narrowly beat France. 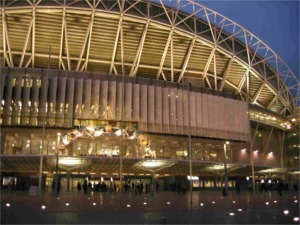 This stadium is venue for a number of the RWC matches this month and next. Saturday is going to be awesome, get yourself down to a pub to watch. It is the most important pool game of the world cup. Have a getaway planned though if things don’t go our way!! I know what you mean about the easier games but they do provide some lovely running rugby when handling errors don’t get in the way. The games against Samoa will be good and the other pools have some interesting games as well. I am looking forward to watching Australia v Ireland the weekend after next (it is just after the SA v Samoa game). That “getaway-strategy” sounds a bit ominous. I had referred to the opening pool matches as the “mickey mouse” stage of the RWC, but kirsten has a point. The important action starts this Saturday, although I think the Ireland-Australia match will be a bit once sided - and only really exciting if you are there! Today of course Fiji beat the USA 19-18, and that game was probably exciting, even if it was pretty irrelevant to the tournament as a whole. The England vs South Africa match that kirsten mentioned kicks off at 20:00 local time, which is 13:00 UK time. Of course, as the match is being played in Perth, SA will have the home crowd advantage. (kirsten and steve leave for Australia tomorrow). Bon voyage! 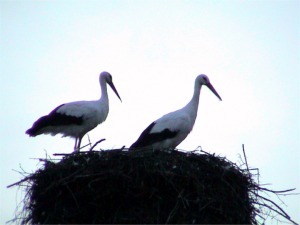 These creatures, the white stork of Alsace nest on the chimney pots. In our winter, they fly south to North Africa, returning in spring when they deliver little babies to pregnant Alsatians. VERY GOOD WEBSITE! I FEATURE I SEE! MOVIE I’M TALKING OF IS “DONT LOOK NOW”, BUT YES ALSO THOUGHT OF HANNIBAL WHEN I WAS THERE AND NOW IN ROME. that st peters is so big (biggest church in the world) that the next 28 biggest churches in the world could fit inside it! and so much more. dylan is half-way through his European tour. Next up he is off to Switzerland and the Cote d’Azure. after the first research on lead someone else came out and said that lead in fish was not too bad as it was in a different form. This piece is a rejoinder to that. flank had pointed me to another article about this issue back in April 2003. This is a picture of my colleagues peter and sophie taken at le clou restaurant in Strasbourg earlier this year. Today I have been thinking about peter quite a bit. He is now actually an ex-colleague, since he gave up the world of consulting at the end of last month, having decided to do something useful with his life. First step: join a culte. I learned lots of interesting things from peter during our 27-month working relationship, including Erich Fromme, the film Götterdammerung, fuel/motor alternatives such as Biodiesel and Elsbett. We discussed why and how Father Christmas got his red robes in 1931. peter was the one who reassured me that the magnetic poles were going to flip over, not earth itself, which was naturally quite a relief. He “introduced” me to his famous compatriot Daniela. peter told us all who paid for the first Gulf War. He introduced me to the delights of swimming in lakes in this region, to some local organic food shops and markets and to Slovio (the 2nd or 3rd most widely understood language in the world!). His partner eva introduced me to eurithmy and showed me how to write with my left and right feet! I miss our many discussions on all the above, and more: peter and eva are now studying together at Dornuch in Switzerland, about 2 hours drive away from here (Haguenau). 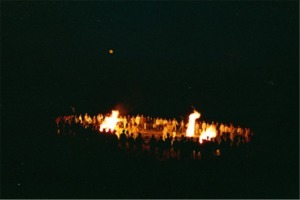 Talking about cults, here’s a picture peter sent me some time ago of his friends celebrating St Jean’s fire back home (in Slovakia). This picture of dylan and bluemeanie enjoying beezie’s sumptuous bed was taken on 9 September, before dylan left on his busabout. 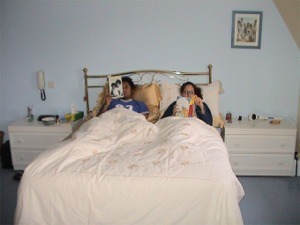 dylan was reading Our Generation while bluemeanie was reading The Age of Innocence. Why do you always discuss things that I can’t talk about? No, I put it on again this morning. Tomorrow morning I leave Oxted at 4am for Stanstead Airport. This will get me to Baden-Baden by 9:15am, and to work by 10. When travelling from the UK, Mondays are a long day. Anyway I had a wonderful weekend with the girls while their mother was away in Wales. 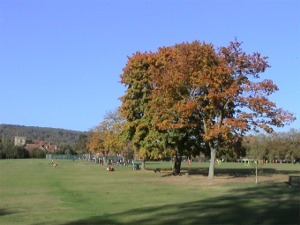 It was a pleasant autumn day in Oxted today. I took this photo on Master Park at about 15:30, facing north towards the church. lil blue meanie went to a birthday party today - involving bowling and lunch. Afterwards she went to hang out in Master Park with her mates. I was nagging her about going in warm clothes, etc. but really it was quite warm. It was about 18C at that time. bluemeanie tells me she has been elected to the Surrey Youth Forum, as a representative of the Tandridge district. I think the forum consists of about 15 - 20 young people from across Surrey. Her first meeting is on Wednesday evening so perhaps we will hear more in due course. flank sent me the following link which says that Mercury in fish is more dangerous than has recently been reported. If you read to near the end of the article you will also see an interesting comment on the recent deaths during the heatwave in Europe. Apparently air pollution is a big factor: this is noticable on a day-to-day, and city-to-city basis. just had pistachio and banana ice cream and it was sooooooooooo good. will go on gondala this afternoon. (looking out for the scary little woman in the red rain coat). I don’t understand this bit about the woman in the red rain coat - perhaps we are watching different movies, because the only one I can think of (the Hannibal Lector one) didn’t have a woman in a red rain coat. Did it? Bon anniversaire! This week my house-mate anna-sofia celebrated her 22nd birthday. 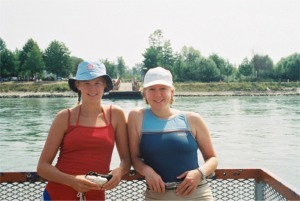 Here she is (white cap) with her friend erieka, also from Sweden, crossing the Rhine into Germany [taken in July 2003]. their way through passport control. I am actually at a place called Baden-Baden. It is a bit like that. The other person says �Where�s that?� or you have to say �Nah, it�s not sarf ovva river�. As stuart gave me a lift to Oxted from Stanstead Airport (1 hour drive), and he was travelling light (hand luggage only) I didn�t bring a suitcase. This saved us half an hour getting through Stanstead. So I packed some dirty laundry into a small over-shoulder suitcase with my laptop. Apparently the limit for hand luggage is 7 kgs. Mine weighed 10,5 kgs but they let me through. It can be a problem with these cheap (20 Euro) flights � they get pretty sticky with the rules and regulations. Coming back they may not be so lenient, because they are pretty �jobsworth� in Stanstead. So today is the start of the RWC. Can�t say that I�m particularly excited though. petite maman is of course, and she sent me a link to a TV schedule giving times and channels for a number of countries. I was at her house-warming last weekend and must have said something because I had seen a print-out of the schedule on her TV. In the office today ashley, who is from Melbourne, was surprised when I mentioned the RWC. He didn�t know it was on, and isn�t interested in rugby at all. Apparently they aren�t very big on the game down there. I laugh Australia wins. His disinterest in this won�t go down very well in our international (though largely French) office. So, where am I now? 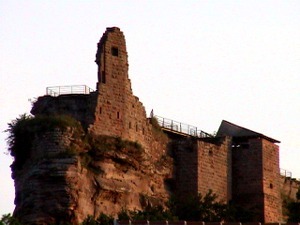 Above is a picture I took at (nearby) Chateau Fleckenstein. La verité, si je mens! 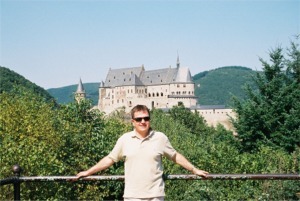 Here we go ... and here’s a recent photo from a day-trip to Vianden in Luxembourg. Got this weblog up and running tonight. Had a few problems. First I installed B2. I didn’t like it too much - the look and feel was wrong, and I couldn’t easily delete my test posts. This system should be better. I’ll get around to enhancing the layout over time, but this is something that I can live with for now. I don’t want to say much about the problems I have had with my webhost at this stage. Perhaps they were just teething problems. If not, you will hear more from me about them in due course.